Another review from Laura – thanks again! This is why I loved this book – because they appreciate the value of screw-top wine bottles. “What is it about motherhood that could put marriage in the shade? What is it about oneself that made one still not want motherhood to be the only identifying mark? What was it about money that seemed – seductively – to promise a taunting vision of freedom even within the confines of these relationships” – Karen. This is a simple tale about friendships – unlikely friendships. It involves two single mothers and as any single mother knows, your friends are usually found in the most unlikely of places because, I think, as a single mother you have to cling to whoever holds their hand out. An older woman decides to befriend two young single moms, Lindsey and Paula and their children. They meet on Friday nights. They don’t do anything special – it is not a book club or a dinner club – they just meet and chat and enjoy being with each other. The little circles widens to include two more ladies, Blaise, a career women and Karen a married mother of 2 little girls. And lets not forget Lindsey’s wayward sister who lives from day to day in a world of her own. Their Friday Nights become a comfort, a safe place to go. Their friendships deepen and strengthen. But then a man arrives onto the seen and the dynamic is forever changed. Their friendships and loyalties to each other are tested. This is a great easy read. It deals with the challenges of being married as well as the difficulties of being a single mother. There is a love story or two. There is story of a sisters love. More than that though there is a very real story about life that Joanna Trollope writes about with insight only gained through experience. A lovely book that I thoroughly enjoyed. 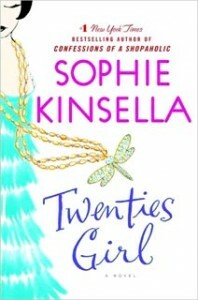 Twenties Girl by Sophie Kinsella has been on my ‘to be read’ list since I discovered that it had been released. Today, I found it in the library -shock horror, a new book in a the library, who would of thought! My eager hands pulled it off the shelf with such glee, it was like finding an unexpected gift in my hands and I went off to the counter to take it out. Returned home, made some lunch and settled down to start reading it. And what a joy! This book is delightful, considering that I finished it in a day, I think that’s saying something. It is perfect holiday reading, light and quirky with a mystery thrown in for good measure. It is a ghost story but not a horror filled one. The book is set in London and starts with Lara about to attend her Great Aunt Sadie’s funeral. The funeral is family only as no one really kept in touch with Sadie and had lived in an Old Age Home after having a stroke. But this is where the fun begins, because Great Aunt Sadie comes back as a ghost of her 23 year old self, but only Lara can see her! And Sadie needs her help to find a very important necklace, once the necklace is found, only then can she pass on over the ‘the other side’. And so follows a most delightful story, a mystery and a love story all rolled into one. Sophie Kinsella weaves her characters so that they are as large as life, with a twenties theme to boot. I found it immensely enjoyable and had me laughing out loud in some places. I have to admit to enjoying all her books to date, she has a fresh and unique way of writing, even if it is ‘chick lit’. This book is a great way to pass the time, if you need to, or to just wallow in some good old fashioned story telling, without too much thinking involved. If you are a ‘chick lit’ or Sophie Kinsella fan, I would recommend her latest book. Jane Green’s latest novel, Girl Friday, is in my humble opinion, her best to date. Known for her ‘chick lit’ with a twist, Jane Green first caught my attention with her novel about love in the midst of books, Bookends. Now for some reason ‘chick lit’ is the one genre of writing that seems to be poo pooed by the general public. Why i’m not sure, as it more often than not provides the perfect means of escape from our everyday lives. Jane Green along with Marian Keyes, Sophie Kinsella, Lisa Jewell and Cathy Kelly have certainly made their names known in the literary world, chick-lit or not. After reading Bookends, I was completely hooked. Jane writes novels that reflect the lives of real women dealing with real life tribulations – motherhood, Mother-in-Laws, ex husbands and mid-life crisis. Girl Friday features Kit, a recently divorced mum of two who is beginning to love her new life and new self as a single woman. The daily struggles she faces, but also the remarkable friends and support network that she has. Not forgetting her dashing boss, Robert McClore who also happens to be a famous novelist with a secret or two himself. This is a love story, but with a degree of mystery thrown in. There is a major twist that had me going till almost the end. If you skim read – you’ll miss this! 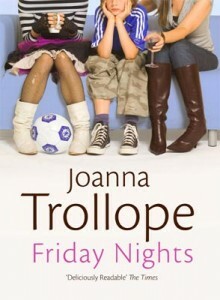 I think what drew me to this novel, was the divorced/single mum aspect. Going it alone. Having to get back into the job-market, support a family and never mind start dating again. I have been there and so identified what Kit was having to deal with. In a nutshell Girl Friday is a captivating tale about love, friendship, marriage and family. Her other novels include Jemima J, Spellbound, The Beach House, Babyville, Swapping Lives, The Other Woman, Second Chance and Mr Maybe. If you’re needing timeout and a novel to simply while away the time, pick up a Jane Green today. Her writing is described by The Washington Post as ‘smart and complex’, by Entertainment Weekly as ‘unexpectedly honest’ and by USA Today as ‘happy, melancholic and beautifully written’.